Are you looking for the best hutch for your bunny? Rabbits need as much care as any other pet would be. Aside from keeping them healthy by giving them the right diet, it’s also essential to provide them with a clean and spacious cage they could nap at day and sleep at night. A cage is also useful to prevent rabbits from breeding. Hence, we have gathered the top 10 best rabbit hutches available in the market today. The following are the most innovative, stylish, and spacious rabbit hutches you can buy without breaking your bank. Pet owners will surely love the appealing color and modern design of this bunny cage from Petsfit. It is constructed using solid wood and classic bunny design in mind. We like its elevated level that will keep your rabbits comfortable when it’s raining, and the ground is soaked. A pull-out tray is included, making it easier to clean the mess after your rabbit. 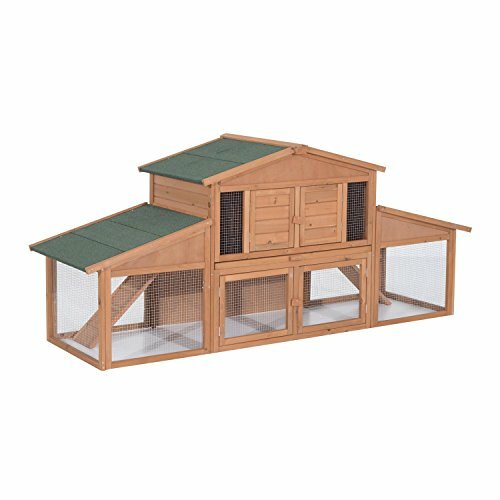 The roof can be opened, allowing you to place your bunnies in and out of the cage with ease. This cage is easy to clean with no grate included. Its grey and white trim will fit any modern outdoor living room or patio. Rest assured that the manufacturer only used a water-based paint to make it safe for your pets even if they love to chew on things. The pre-drilled holes of the cage make it easy to assemble in just a few seconds. Next, we have the Advantek rabbit hutch. 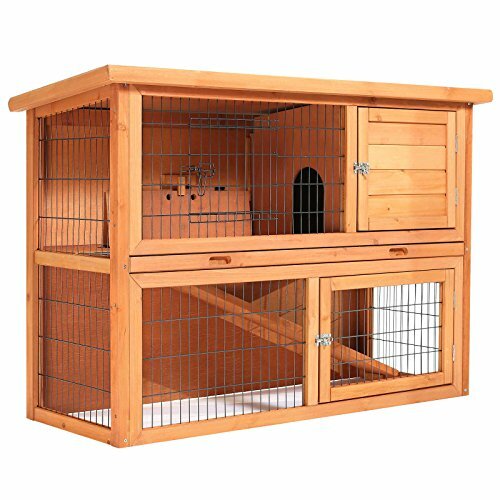 Provide your rabbit a comfortable country-style cage that they can lounge day in and out. 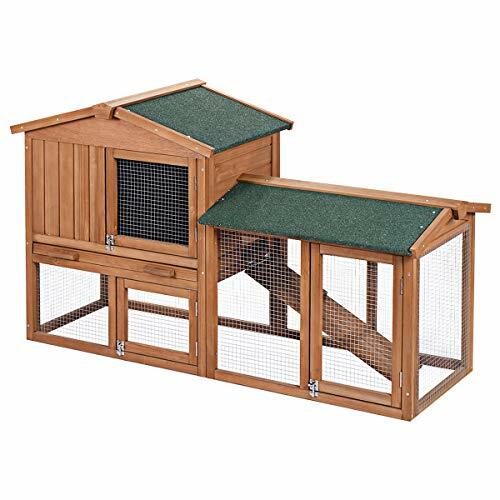 The stilted nesting box and outdoor enclosure provide both a condo and a play area for your pets. We also like how its beautiful auburn and white color looks good in any modern patio. The connected run surrounding in the rabbit-friendly wire will allow your rabbit to explore the entirety of the cage in safety. The package includes a pull-out tray for easy maintenance and access door to outside area. Now you can quickly put your rabbit in and out. It is made with Advantek’s GoneGreen lightweight insect-resistant and rot-resistant fir lumber that can last for a long time with proper use and maintenance. Upon arrival, the product requires a minimal assembly, and it’s ready to use. Next, we have the Tangkula cage. It can act as both rabbit hutch and a hen cage. The sturdy construction is waterproof, making it an excellent choice for placing your pets outdoors. The natural fir wood is painted with eco-friendly waterproof non-toxic varnish. Rest assured that even if your bunnies love to chew on things, it will never cause any harm to them. For stubborn rabbits who like to escape, the firm and solid wood will keep them safe from the potential predators outside. 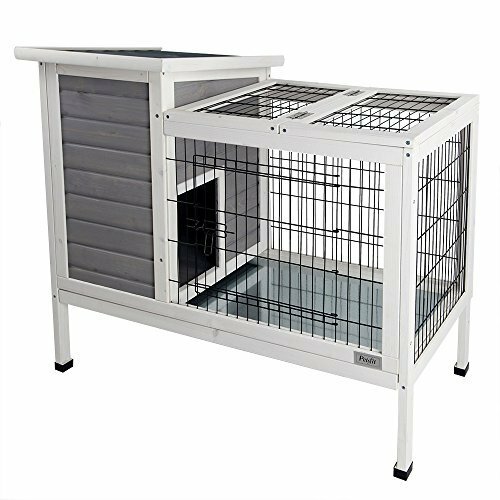 The cage is waterproof, anti-corrosion and even UV-resistant, making it a great warm house for your pets for many years to come. Its spacious space can also accommodate multiple rabbits at a time. A nesting box, resting box, and the ramp are included in the package. The sliding door makes it easier for the rabbits to enter and exit the house. We like how the timber ridges can help to keep the cage stable and avoid slipping back. The gridding doors also provide increased visibility for your pets while they are inside. Check out this spacious cottage-style rabbit hutch that’s finished in non-toxic auburn and white paint. Now your bunnies can play and rest in style. The three built-in metal sliding trays allows you to clean the mess with ease. It also has three easy to access entry doors for your rabbits to get in and out whenever they want. Thanks to the generous size of this product, you can accommodate multiple rabbits at a time in this condo and playground in one unit. It’s also manufactured for easy assembly. The pre-drilled holes make it easier for you to attach the roof, walls, and nest box. In just a few minutes, your bunnies can now enjoy this well-ventilated space. It also promotes proper air circulation inside. The second-floor nesting box is both roomy and insulated, allowing your rabbits to stay indoors during cold rainy nights. This wooden rabbit hutch from Confidence is a great way to keep your bunnies safe during day and night. And not just rabbits, you can also use it for guinea pigs and ferrets. It is made of furniture-grade wood with the waterproof antifungal finish. Rest assured that even if your furry friends love to chew on things, the wood will never pose a threat to their health. 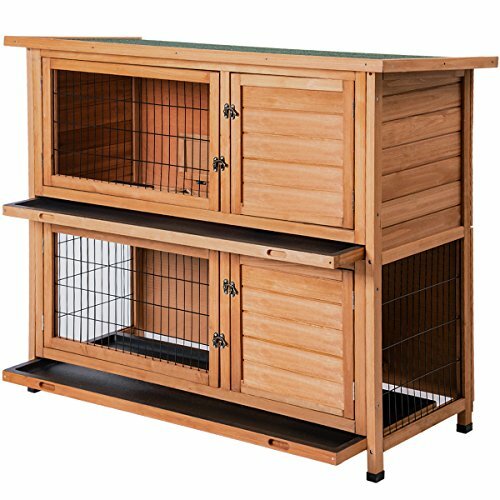 The double-leveled hutch provides a spacious room for a rabbit or two. It also features a built-in open run area. Rest assured that the heavy-duty steel wire can last for a long time. This 62-inch model is suitable for pet owners who have limited space in their house. The ramp will also allow your rabbit to move from nesting box to the play area. Its impressive craftsmanship will look great in any modern or country-styled patio. Check out this deluxe large wooden bunny hutch. The front of the living area and the run pens for easy access to your pets. We also like how the run area provides an open feeling for your rabbits, not making them feel like they are trapped inside. The multiple ramps will also allow your pet to enter the inner box without difficulty. You don’t need to compromise the style of your rabbit’s hutch to ensure an effective functionality. Upon arrival, minimal assembly is required. Rest assured that all parts and hardware necessary is included in the package. All you need to do is spend a few minutes in assembling, and your rabbits can start using this hutch. It also features a detachable bottom sliding pan that allows you to clean the litter without difficulty. For pet owners who are looking for a large and spacious rabbit hutch, check out this unit from Merax. This large wooden rabbit hutch is designed with striped wooden plants that extend the service life of the product and it’s chew-resistant. There are two separate rooms with two trays that are designed for multiple uses. This rabbit hutch is made of fir wood that’s known for added durability. We like its waterproof roof that will allow you to place the unit outside with peace of mind. For cleaning maintenance, all you need to do is to pull out the drawer. 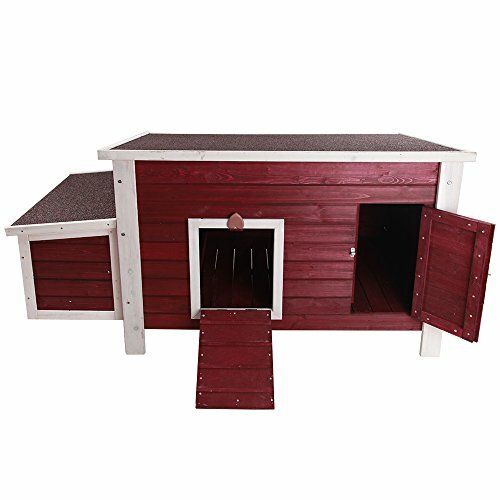 With a total of four doors, your rabbits can get in and out of the wooden hutch. Its excellent features make it a great choice for pet owners who are on a tight budget. For modern enthusiasts, check out this rabbit hutch from Trixie pet products. 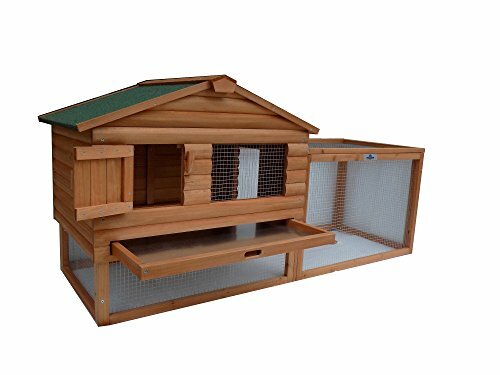 This two-storey natural rabbit retreat is made of wood and stained pine weatherproof finish that can serve your bunnies for years to come. It requires little to no maintenance. The spacious area will allow your rabbits to roam around freely and its non-slip ramp and interior hatch door will give options to restrict any access and keep them safe at night. Two front doors provide easy access and a hinged roof coated with weatherproof paint. 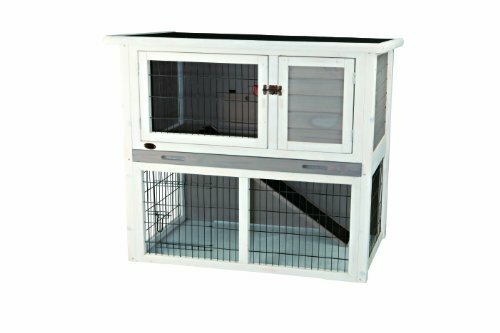 The powder-coated metal lattice and lockable hatch will protect your pet all the while keeping out unwanted visitors from entering the hutch. Plastic trays are included in the package for easy maintenance. 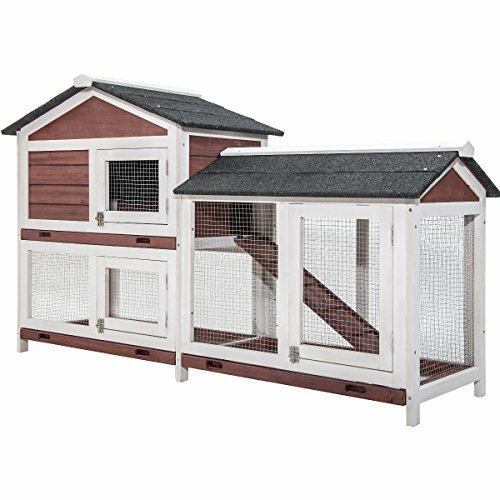 This is a perfect shelter for your rabbits with the added charm of gray and white trim for any modern house out there. Anyone will fall in love with this beautiful red and white Petsfit rabbit hutch. Some bottom slabs gaps will allow good air circulation. Three-floor panels are detachable that will enable you to clean it without difficulty. However, you cannot open the top part. The side nesting box with divider provides a good place for your rabbits to sleep during the night. 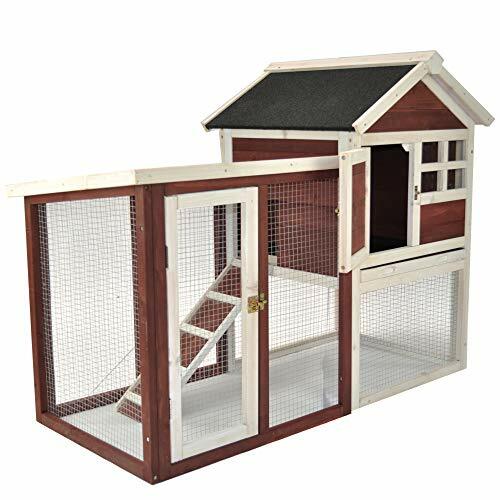 It is made of solid rain-resistant fir wood construction that keeps the cage durable and can serve you for years to come. Thanks to its generous size, this hutch can fit two grown-up rabbits inside. Its large front doors provide easy access in and out. Buyers can enjoy up to one-year limited warranty upon purchasing the product. Lastly, we have the bunny cage from SmithBuilt crates. This premium cage is made of weatherproof materials. It’s constructed with durable fir wood and treated to withstand rain and other harsh elements. This deluxe bunny hutch can last for a long time with proper care and maintenance. The wire sections are finished with an ultra-durable epoxy coating that’s resistant to rust, fade, and corrosion. The roof is covered with asphalt that will help to protect your pets from extreme weather. The cage is divided into sleeping and living areas, allowing your rabbits to roam around freely. An open run downstairs promotes ground exercise for your bunnies. Its non-slip ramp also makes it safer for them to travel from level to level. A door separates the inner nesting box to the living room for added privacy.